Located at the top of the stairs of Eastern Beach swimming pool & has the best views of Geelong.It also has a beautiful garden to enjoy and you can also enjoy the peace & quiet .Relax in the egg chair on the balcony while having a coffee or wine. The Apartment has brand new furniture and a gas log fire to keep warm in winter. Also a large 7.1kw air conditioner to keep very cool in summer. This exceptional property in a commanding waterfront position features a two bedroom apartment with bay views. Boasting a spacious light filled lounge overlooking the bay and towards Eastern Beach Promenade. Comprising of two bedrooms , the master bedroom has a Queen size bed with stunning views towards the yacht club.The second bedroom has 2 x single beds, which can be converted into a double size bed. Also original kitchen and updated bathroom with a single garage. Imagine being able to wander out the front door and cross the road to the renowned Beach House Cafe or take a lazy stroll around the bay and waterfront promenade. Take the kids to the free public swimming pool. 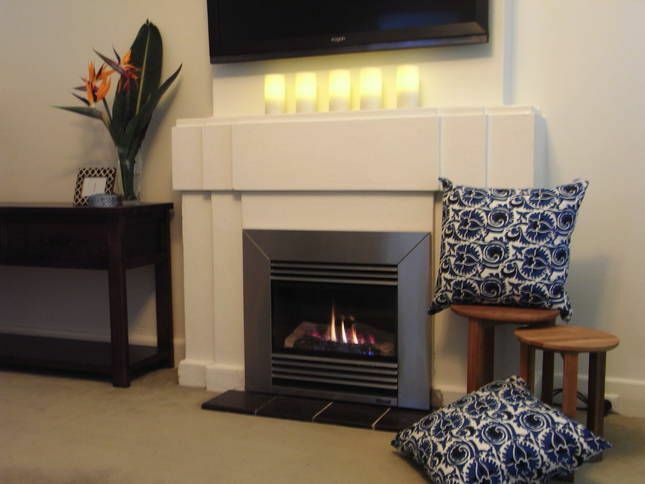 Walking distance to CBD, local transport and the delicacies of nearby restaurants. Located on the bay front of Eastern Beach.Just a short walk to the beach, pool,restaurants and bars, fashionable shopping, supermarket, museums, Geelong train station,Botanical Gardens, and hospitals. The Apartment has a beautiful garden. Beach & Public pool across the road. East Geelong Golf Course next door. Beach House Restaurant across the road. Ferris Wheel Ride just down the road. Seaplane rides just down the road. Helicopter rides just down the road. Boat ramp just down the road. Adventure Park 15 minutes away. Simonds AFL Stadium 5 minutes away with free parking @ our second property. Surf Beaches 15 minutes away. Fully equipped kitchen with a brand new stove & oven. 46" LED TV with Blu ray & movies. Great house to stay in Geelong! Thank you for a wonderful weekend away. The apartment is beautiful and very welcoming. The view of the beach from the street is gorgeous! The perfect spot for a little getaway. A nice comfortable place overlooking the sea. A home away from home. My sister and I had a nice holiday. But I wish I had met the owners to say a friendly "Thank You" in person. A friend who had recommended this place has been there a few times. I too hope to be there again next year. Quirky apartment on the waterfront. The apartment is quite old in a larger block but the owners have done a great job with furniture and decor etc to make it feel like home. So close to everything. I would stay again. Overall the property was comfortable and everything worked. The beds were very comfortable and the shower is great! We were a bit dussapointed with the kitchen area though. Very very basic, old and minimal cooking utensils and items. Everything worked tho. There were large kitchen carpet floor mats that very dirty and smelly and impossible to clean. We put them outside during our stay. The back area of the flats always had rubbish blowing everywhere...smelly mop and no dustpan and broom. Basically an ok place to stay... but not if you like to cook! Sea breeze was the best!